A new-generation satellite that will contribute to the sustained accurate “nowcasting” of weather is continuing its checkout at the Spaceport in French Guiana for launch on an Arianespace heavy-lift Ariane 5 mission this summer. MSG-4 is processed in the Spaceport’s S1B clean room. 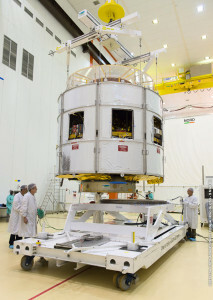 Eumetsat’s MSG-4 meteorological satellite – the fourth and final spacecraft in Europe’s series of Meteosat Second Generation spacecraft – has been in the Spaceport’s S1B clean room facility for processing. MSG-4 will join four other Meteosat-series platforms that currently are operational in geostationary orbit at 36,000 km. above the equator. These are the three previous Meteosat Second Generation satellites, all launched by Arianespace on Ariane 5s (Meteosat-10 in July 2012, Meteosat-9 in December 2005, and Meteosat-8 in August 2002); along with the remaining operational first-generation platform, Meteosat-7, which was lofted by an Arianespace Ariane 4 in September 1997. After launch, MSG-4 will be stored in orbit, ultimately being named Meteosat-11 when it becomes operational to bridge the gap between Meteosat-10 and the initial Meteosat Third Generation (MTG) spacecraft – which are scheduled to be orbited in 2019 and 2021. In contrast to the boxy-type telecommunications satellites typically launched by Arianespace, the Meteosats are cylindrically-shaped drums. This allows their spin-stabilization in counter-clockwise rotation around the longitudinal axis, and enables on-board instruments to scan the Earth coverage area. Built by a Thales Alenia Space-led European consortium, and developed through a cooperation of the European Space Agency with Eumetsat, the Meteosat Second Generation spacecraft are 3.2 meters in diameter and 2.4 meters tall, with an in-orbit mass of 1,200 kg.